After launching its latest multi-touch iPad, Apple has released its iPhone SDK 3.2 beta for developers to start developing applications for iPad. The iPhone SDK 3.2 beta is being designed to include all the necessary tools which allow the developers to start developing and optimizing iPhone OS applications for iPad. 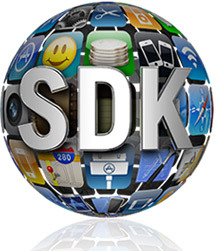 The iPhone SDK 3.2 beta is only available for iPhone Developer Program members. Download iPhone SDK 3.2 beta which contains all the tools for developers to start developing applications iPad. Able to access iPad Simulator for build, test and run iPad application on Mac. iPad Programming Guide which introduces features of iPad and how to deploy the features into the applications. Design an incredible user interface and user experience for iPad application with iPad Human Interface Guidelines. The fees for iPhone Developer Program is priced at $99 for standard program and $299 for enterprise program.